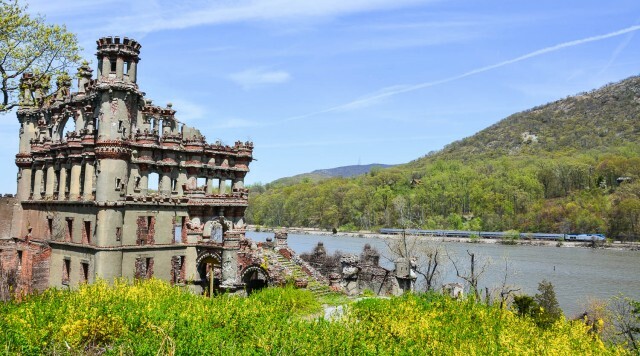 Starting this week, it will be a little easier to visit the mysterious castle ruins seen from train windows on the Hudson lines. 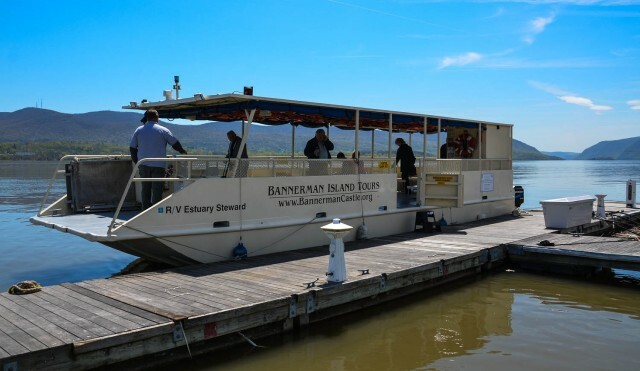 On May 4th, Bannerman Castle Trust will officially debut the new-to-them RV Estuary Steward, a 40′ by 12.5′ boat donated by the Esopus Meadows Lighthouse. I had a chance to check out the Bannerman Island Tour on a mid-week press trip departing from Torches Landing in Newburgh, NY. Accompanied by my 13-year-old son, Alex, we were eager to get a close up look at the enigmatic structure on Pollepel Island in the highlands of the Hudson River. Alex was delighted to have an unscheduled school break, but he also had an ulterior motive for investigating the island castle. He was hunting for video game layout ideas. How did Pollepel Island get its name? Frank Bannerman, the eccentric Scottish munitions dealer who built the castle, might have appreciated such industry. Bannerman’s Castle was not so much designed as it was built piecemeal over time, inspired by castles Frank saw on his European travels. 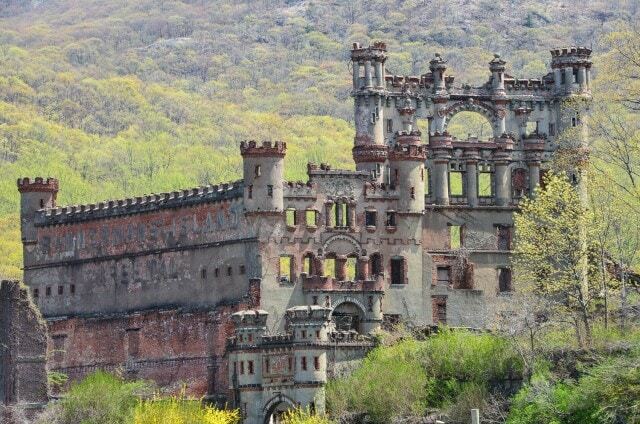 Time has not been kind to Bannerman’s Castle. Frank Bannerman purchased Pollepel Island in 1900 to use for storage of surplus goods acquired after the Spanish-American War. Construction didn’t cease until Frank died in 1918, and it was only two years later that an explosion rocked the island. Neil Caplan, Executive Director and Founder of Bannerman Castle Trust, tells a story about that explosion. It seems that Frank Bannerman’s wife, Helen, was a prolific gardener who succeeded in covering the entire island in greenery within fifteen years. But on a summer day in 1920, she took a break from lying on the hammock to get a glass of lemonade. While she was getting the drink from the main residence, 200 tons of shells and powder exploded in an ancillary structure to the castle, destroying a portion of the complex. Helen returned outdoors, only to discover that a portion of the building had landed right on her hammock. After a storm in 1950, the buildings were left vacant, vulnerable to looters and vandals. A fire in 1969 destroyed roofs and floors, leading to the island being marked off-limits to the public. Guided outdoor tours resumed a few years ago, just in time to witness another loss of structure–nearly 40% of the front wall and about half of the east wall collapsed in 2009. 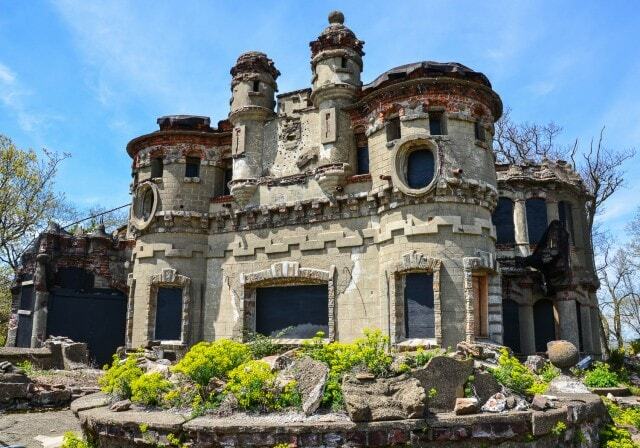 Things are looking up now for Bannerman Island. 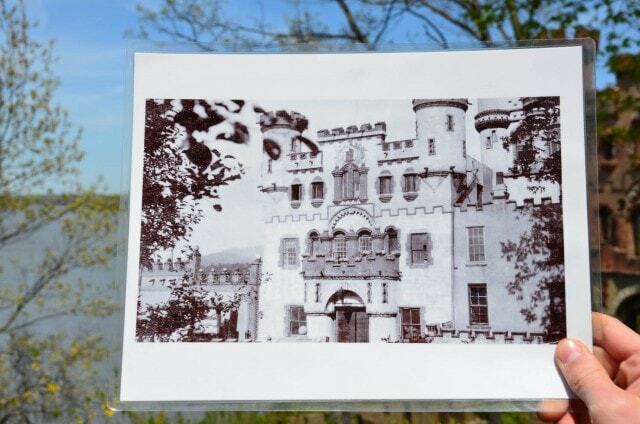 In addition to the tour boat donation, Bannerman Castle Trust is anticipating opening up the main floor of the family home to visitors in June. The 2013 Tour Schedule lists departures from Torches Landing in Newburgh, NY, the Beacon Ferry Dock in Beacon, NY, and the Cold Spring Village Dock in Cold Spring, NY. Scheduled boat tours include a variety of excursions, including live music concerts and a Just Off Broadway production of Godspell. And kayak tours have been scheduled with Hudson Valley Outfitters and Storm King Adventure Tours in Cold Spring, NY, and Mountain Tops in Beacon, NY. Our own boat tour was an abbreviated version of the 2 and half hour excursion. We were warned to expect a 72-step climb on the island, but it was hardly arduous (even with my asthma condition.) Most children, even young walkers, should be able to manage the island walking tour. As for Alex, I think a video game version of Pollepel Island is imminent. Planning a trip to Bannerman’s Island? Check the website here for tour schedules and ticket purchases. If you do decide to depart from Torches Landing in Newburgh, you can expect plenty of free parking and a row of restaurants on Front Street, facing the marina. Getting to Torches Landing in Newburgh, NY – from Albany (1:30 minutes by car); from New York City (1:20 minutes by car); Metro North runs the Hudson Line between New York City and Beacon Station (where you can board the Bannerman Island Tour at the Beacon Ferry Dock) or take the 10-minute ferry from Beacon Station to Newburgh’s Front Street, see ferry schedule here and the Hudson Line schedules & fares here. 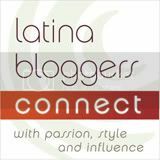 Love the title of this post! It is such a special place…and a memorable outing. The building is beautiful now, I can only imagine what it it looked like back when. Amazing American history. This looks really interesting and certainly a good photo opp!